I would berate myself for slipping out of yoga (capital-S Self) and into life (small-s self). Then I would retreat from life (self) back to yoga (Self) to recover. I felt like a hamster on a wheel, never getting anywhere. With all the yoga I do, I thought I shouldn’t experience intense emotional pain. I shouldn’t have a bothersome, busy mind. I would become frustrated. I didn’t know it was possible to live in the “AND.” The Shaktipat Retreat gave me a whole new perspective. 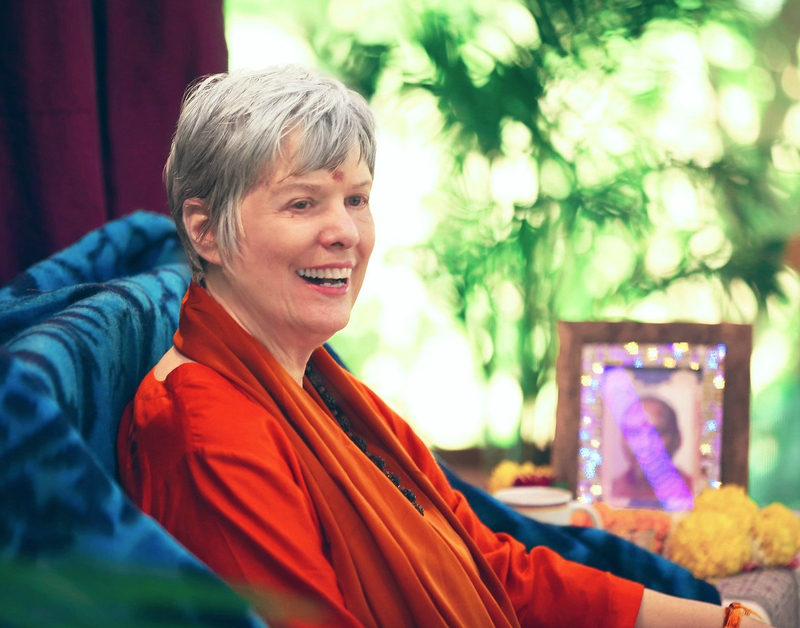 Swami Nirmalananda gives intentional shaktipat three times during a Shaktipat Retreat. Other time is spent in blissful preparation, with discourses, meditations and chanting. Meal breaks nourish the body with blessed food. Our Guru designs the menus. The whole experience is thus prasad, Guru’s sacred gift. On Saturday, Swamiji leads us in the pre-dawn Sri Guru Gita chant and meditation. After breakfast, as well as a discourse and ecstatic preparation chants, Swamiji gives the first intentional shaktipat. Although there are three levels of shaktipat — mild, medium and intense — she always gives intense shaktipat. What a recipient gets depends on their ability to receive. At first, I thought that not much was happening for me. I knew that meant I needed to make myself more available, more vulnerable. I needed to let go of anticipation and judgment. As soon as I did, I began to feel the familiar power of Grace. I felt the shakti rippling through the room and Kundalini rippling through me. In repeated Shaktipat Retreats, I have learned to let go of expectations. I’ve experienced similarities and differences in my shaktipat experiences. I’ve stopped comparing my experiences to that of others. Shaktipat gives us just what we need. Our individual experience is customized. For me, shaktipat is more about what happens when I return to daily life. Integrating my shaktipat experience there, I am more reliable and more present. This happens because shaktipat has cleared internal blockages. My inner knowing of Self deepens. I feel more secure and stable, even during tumultuous times. Storms swirling around me do not change who I am on the inside. I can be in the discomfort that life sometimes puts forth, AND experience my Self simultaneously. My mind can be busy, even multi-tasking to accomplish what needs doing. AND I can be present and aware. My priorities are clearer. I dive deep and do more yoga. AND, at the same time, I fit life (and my many small-s selves) in around my Self. When I notice the disturbances in the atmosphere around me, I know to look inward. The answers are within. I am grateful beyond words for the power of shaktipat, revelation, Grace and the great Being in our midst, Sadguru Nirmalananda Saraswati. They are all the One, who shines the light upon us so that we may see the light that we are. This entry was posted in Ashram News on April 2, 2019 by Svaroopa Vidya Ashram.